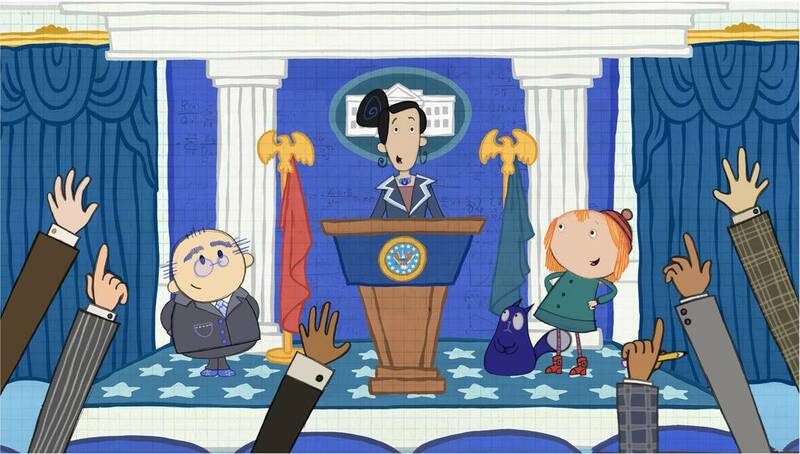 Arlington, VA, March 8, 2016 – On Monday, March 28, PBS KIDS will premiere the first PEG + CAT movie, “Peg and Cat Save the World.” The one-hour special will be followed by a week of new episodes of the Emmy© Award-winning series from The Fred Rogers Company, beginning Monday, April 4. In their all-new adventures, Peg, Cat and their friends will use problem-solving skills to overcome an array of challenges – from collecting 100 chickens running loose in the White House to working with friends around the globe to stop a planet-sized pig from destroying the Earth. PBS KIDS, the number one educational media brand for kids, offers all children the opportunity to explore new ideas and new worlds through television, digital platforms and community-based programs. Kidscreen- and WebbyAward-winning pbskids.org provides engaging interactive content, including digital games and streaming video. PBS KIDS also offers mobile apps to help support young children’s learning. The PBS KIDS Video App is available on a variety of mobile devices and on platforms such as Roku, Apple TV, Amazon Fire TV, Android TV, Xbox One and Chromecast. For more information on specific PBS KIDS content supporting literacy, science, math and more, visit pbs.org/pressroom, or follow PBS KIDS on Twitter and Facebook. About the Corporation for Public BroadcastingThe Corporation for Public Broadcasting (CPB), a private, nonprofit corporation created by Congress in 1967, is the steward of the federal government's investment in public broadcasting. It helps support the operations of more than 1,400 locally owned and operated public television and radio stations nationwide. CPB is also the largest single source of funding for research, technology, and program development for public radio, television and related online services. For more information, visit www.cpb.org and follow us on Twitter @CPBmedia, Facebook, and LinkedIn. The NSF Advancing Informal STEM Learning Program seeks to advance new approaches to and evidence-based understanding of the design and development of science, technology, engineering and math (STEM) learning in informal environments; provide multiple pathways for broadening access to and engagement in STEM learning experiences; and advance innovative research on and assessment of STEM learning in informal environments.